The Alaska moose (Alces alces gigas) or giant moose or Alaskan moose is a subspecies of moose that ranges from Alaska to western Yukon. The Alaska moose is the largest North American subspecies of moose. Alaska moose inhabit boreal forests and mixed deciduous forests throughout most of Alaska and most of Western Yukon. Like all moose species, the Alaska moose is usually solitary but sometimes will form small herds. 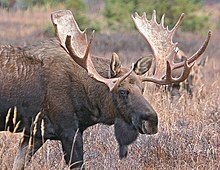 Typically, they only come into contact with other moose for mating or competition for mates. During mating season, in autumn and winter, male Alaska moose become very aggressive and prone to attacking when startled. Alaska moose have a similar diet to other moose subspecies, consisting of terrestrial vegetation forbs and shoots from trees such as willow and birch. Alaska moose require a daily intake of 9770 kilocalories (32 kg). Alaska moose lack upper front teeth but have eight sharp incisors on their lower jaw. They also have a tough tongue, gums and lips to help chew woody vegetation. Male Alaska moose can stand over 2.1 m (6.9 ft) at the shoulder, and weigh over 1,400 lb (635 kg). The antlers on average have a span of 1.8 m (5.9 ft). Female Alaska moose stand on average 1.8 m (5.9 ft) at the shoulder and can weigh close to 478 kg (1,054 lb). The largest Alaska moose was shot in western Yukon in September 1897; it weighed 820 kg (1,808 lb), and was 2.33 m (7.6 ft) tall at the shoulder. Alaska moose with the Chukotka moose, matches the extinct Irish elk as the largest deer of all time. Alaska moose have no social bonds with each other and only come into contact with each other to mate, or for two bull moose to fight over mating rights. Although a bull moose is not usually aggressive towards humans, during mating season it may attack any creature it comes into contact with, including humans, wolves, other deer or even bears. Bull moose often get their antlers locked during a fight, and both moose typically die from starvation. Bull moose call out a subtle mating call to attract female moose and to warn other males. If a male moose loses to another male, he has to wait another year to mate. Alaska moose mate every year during autumn and winter, and usually produce one or two offspring at a time. At around 10–11 months, yearling Alaska moose leave their mothers and fend for themselves. Alaska moose are hunted for food and sport every year during fall and winter. People use both firearms and bows to hunt moose. ^ Nancy Long / Kurt Savikko (2009-08-07). "Moose: Wildlife Notebook Series – Alaska Department of Fish and Game". Adfg.state.ak.us. Retrieved 2009-11-27. Wikimedia Commons has media related to Alces alces shirasi. Van Ballenberghe, Victor (August 1987). "Giants of the Wilderness: Alaskan Moose". National Geographic. Vol. 172 no. 2. pp. 260–280. ISSN 0027-9358. OCLC 643483454.